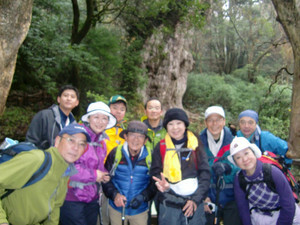 In late autumn, for the period of November 23 to 25, some members of the Shimada Juku and myself went on a tour to Yakushima and challenged mountain climbing for the purpose of worshipping the Yakushima "Jomon"cedar tree, the alive tree believed to be the oldest in the world. Yakushima is a small island located in the south sea of the Japanese archipelago. This is known and cherished by many Japanese as the world natural inheritance recognized first for Japan. The island is of some 130 km circumference and some 40km diameter. In this small island made largely of granite stones, there exist a couple of dozens of relatively high mountains. Eight of them are called "inner mountains," the highest of which is 1930m, which is highest of Kyushu island area. Since these mountains are steep standing alone in the southern sea, warm winds which hit the mountains become clouds and fall as rains. Some say that in Yakushima rain falls more than 30 days in a month, and thus people can enjoy abundant pure water for their use. Since the hight of the mountains are comparable with those of northern part of Japan, in winter, snow falls and accumulates on their tops while the sea remains warm as it is in the quasi tropical zone. Because of this unique location and structure of the island, there exist many precious species of plants and animals just as though a natural museum. The island is well known for having many old and huge cedar trees. Many of them are well older than one thousand year. 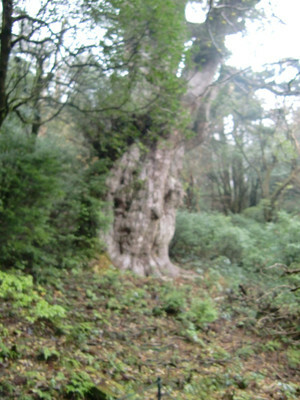 There exist a few very old cedar trees which are estimated by scientific assessment as old as several thousand years. One of them is called "Jomon" cedar tree, which is assessed to be some 7000 years. Jomon is the name of the race who inhabited on Japanese archipelago before civilization of a couple of thousand years, and this particular tree is nicknamed by this title. And this tree has become an object of worship by trekkers. I tried in May last year to climb the mountains to reach and worship the tree but was unable to do it partly disturbed by heavy rains and partly by the lack of power. Since I was nominated last year as the tourism ambassador of the island, I thought I have to accomplish this objective. One of the objectives of my visit of the island this time was to revenge the failed trial. For nearly a year, I tried to exercise both by walking several miles back and forth between my house and my personal office, and bending and stretching legs a couple of hundred times every day. And a formal objective was to attend the ceremony of the Yakushima town to celebrate the five year history of its establishment as a tourism ambassador. 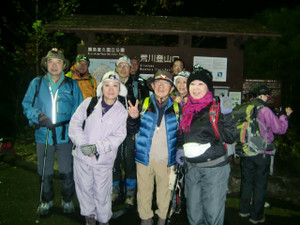 Our team of the Shimada juke consisted of 8 nice and lively members. Although the weather forecasting predicted rains on the day of our visit, rain apparently stopped before our arrival and extremely luckily there were no rains during the three days of our stay on the island. Even the days of our visit were three consecutive national holidays, officials of the town cordially welcomed us at the airport and guided us around some sightseeing spots before they brought us to the small but cozy hotel at the seashore. The owner of the hotel kindly arranged a dinner of a Japanese room style boat at the lower reach of the river. Surprisingly, the owner of the hotel, Mr.Tashiro, Hideto, turned out to be an alumni of Chiba University of Commerce where I serve as president. We all enjoyed the delicious dinner and poetic atmosphere of the foggy water surface. Next morning, we woke up before 4 am and left the hotel at 4:30 on the bus. The bus arrived at the entry spot of the trekking course around 5:00am. After taking quick breakfast, we started walking. The trail was not a road. It is the rail which was used for trams for carrying cedar trees in the past. Since this is an old rail and sleepers are not laid out regularly, it was quite a burdensome labor to walk stably. The rail gradually goes upwards. We needed to walk about 6 miles and it took a few hours. Then, we had to climb a rather steep slope of the mountain following the paths of rocks, roots of woods and sometimes stairs made not for trekkers but to protect sedar roots from steps of trekkers. The distance of mount climbing was only a couple of miles but we needed to climb some 600m. It was not an easy trail. Spending another couple of hours we finally reached the holly "Jomon" cedar tree. We went further to reach an mountain cabin to take lunch. On the way coming back, we visited formally the tree and worshipped whole heartedly to the tree and sang a popular song to cheer the youth together expressing our thanks to the god of the holly tree. The way back was not easy as well. Although we did not use our energy as climbing up, but we had to be very careful not to slip on the rocky and rough and steep surface of the downslope. After walking down the mountain slope, we reached the rail way trail. While we were walking the light of the day was completely gone, and we had to walk in the darkness relying of a modest light of the head lamp. We arrived at the starting point around 7 pm. We altogether struggled in the mountain area for about 14 hours. Luckily, all of us came back safely and none of us suffered from any accidents or injures. In the hotel, after taking bath, we enjoyed the victory "fiesta" whole heatedly with a special treatment provided by Mr. Tashiro, Hideto. Next day, we all attended the ceremony of the town of Yakushima. The ceremony was well attended by town officials, representative islanders, young students and many guests, and conducted formally and solemnly. I was at the same time deeply impressed that all people living in this island love, cherish and try their best to keep the island beautiful. I, and I believe my friends as well, felt keenly that I would like to come back to this island again.